Fig 2. Geographic coverage of the potential natural vegetations. A) The percent area protected of potential natural vegetation types by the protected areas network (GC). B) As A, but only considering the more strictly protected PAs of IUCN class Ib-IV. Countries in eastern Africa have set aside significant proportions of their land for protection. But are these areas representative of the diverse range of species and habitats found in the region? And do conservation efforts include areas where the state of biodiversity is likely to deteriorate without further interventions? 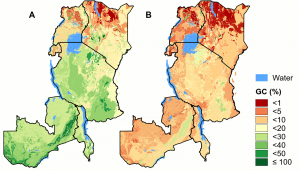 Roeland Kindt from the World Agroforestry Centre and others have adopted a recently developed high-resolution potential natural vegetation (PNV) map for eastern Africa as a baseline to more effectively identify conservation priorities. In article in the journal PLoS ONE, Paulo van Breugel, Roeland Kindt, Jens-Peter Barnekow Lillesø, and Michiel van Breugel show substantial differences in the conservation status of PNVs. Particular PNVs in which biodiversity protection and ecological functions are at risk due to human influences are revealed. The authors argue that their data and approach will help with regional and national implementation in eastern Africa, and are valid for other geographic regions. 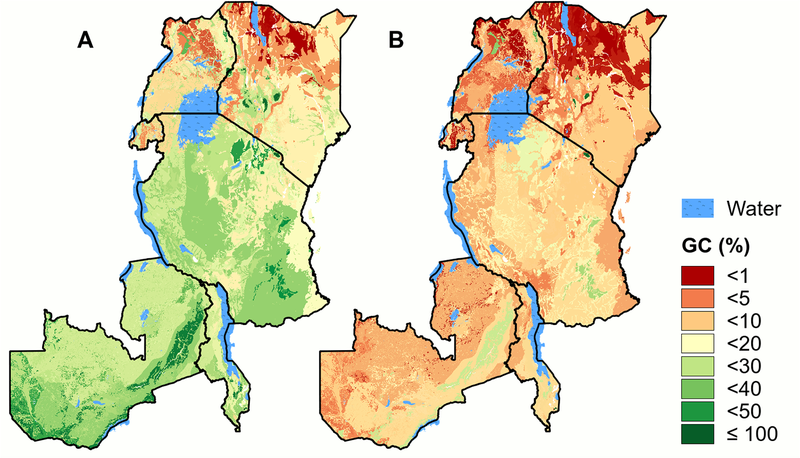 All data sets developed for this study are publicly available at http://vegetationmap4africa.org/applicat​ions. Kindt, a scientist for the FTA Flagship 2 project Management and conservation of forests and tree resources, draws attention to a useful tool for researchers, the Agroforestry Species Switchboard that currently documents the presence of 22,212 plant species in 13 web-based databases.